At the south end of Los Muertos Beach you'll find Playa Las Amapas, named for the scenic neighborhood that clings to the verdant cliffs overlooking sandy beaches. Just minutes away from the shops, boutiques, restaurants and lively nightlife found in the Olas Altas area, the Las Amapas residential development boasts luxury homes and villas, extravagant penthouses, and deluxe condominiums with every amenity for perfect vacations or resort living. 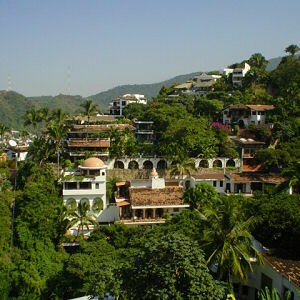 Our Las Amapas area photo gallery features pictures of the attractive homes and condominiums built on the face of steep cliffs and perched over beautiful beaches, photographs of the area's unsurpassed views of Puerto Vallarta and Banderas Bay, and photos of residential real estate properties for sale in the Las Amapas area of Puerto Vallarta on Mexico's Gold Coast.